A labyrinth? Here in Calgary? 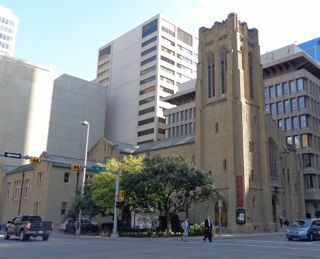 I had always assumed (incorrectly, as it turns out) that labyrinth was just another word for a maze – a maze offers you choices, while a labyrinth has only one track leading in and out – and was intrigued to discover there are several to be found here in Calgary. Labyrinths have been around for thousands of years, featuring in ancient tales and legends as well as being a spiritual tool used in many religions. Perhaps the most famous religious labyrinth is to be found in Chartres Cathedral in France. Apparently, about one thousand years ago, when it became to unsafe for Christians to make a pilgrimage to Jerusalem, pilgrims began visiting the big cathedrals in Europe; Chartres, Canterbury and Santiago de Compostello. Somewhere between 1200-1240 a labyrinth was laid in the floor of Chartres which became known as The Road to Jerusalem. Not a maze, but a single track, it provided an opportunity for the faithful to replicate a pilgrimage to the Holy Land by following the path on their knees while praying. But what has this to do with Calgary? 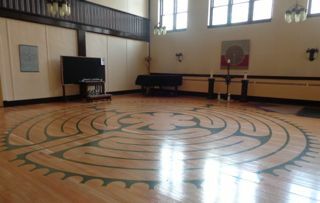 The labyrinth in Knox United Church, in the heart of Calgary’s downtown, is open to all – Christian or not – from Monday-Friday, 9am-7pm, and is based on the Chartres labyrinth. When I visited the labyrinth yesterday, I walked it twice. The first time was from sheer curiosity: Was there really only one way in and out? Did I cover every section of the intricate design? I’m not religious, but I turned on the CD that is provided and tried to quiet my mind. There is no right or wrong way to walk the labyrinth, but I found that by just taking my time and concentrating, at the end of 20 minutes I returned once more to the entrance of the labyrinth feeling calm and relaxed. 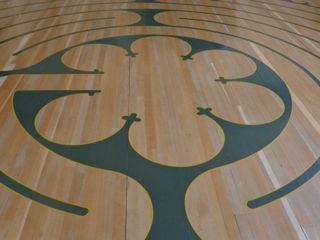 The centre of the labyrinth, Knox United Church, Calgary. The labyrinth in Knox United Church is not the only one in Calgary; there are several more, including an outdoor one in Sarcee Park. If you’re interested in finding one near you, please check out this worldwide labyrinth locator.